Background and objectives: Cinacalcet, a novel calcimimetic, targets the calcium-sensing receptor to lower parathyroid hormone (PTH), calcium, and phosphorus levels in dialysis patients with secondary hyperparathyroidism (SHPT). This study compared the efficacy of a cinacalcet-based regimen with unrestricted conventional care (vitamin D and phosphate binders) for achieving the stringent National Kidney Foundation Kidney Disease Outcomes Quality Initiative (KDOQI) targets for dialysis patients. Study design: In this multicenter, open-label study, hemodialysis patients with poorly controlled SHPT were randomized to receive conventional care (n = 184) or a cinacalcet-based regimen (n = 368). Doses of cinacalcet, vitamin D sterols, and phosphate binders were adjusted during a 16-wk dose-optimization phase with the use of algorithms that allowed cinacalcet to be used with adjusted doses of vitamin D. The primary end point was the proportion of patients with mean intact PTH ≤300 pg/ml during a 7-wk efficacy assessment phase. Results: A higher proportion of patients receiving the cinacalcet-based regimen versus conventional care achieved the targets for PTH (71% versus 22%, respectively; P < 0.001), Ca × P (77% versus 58%, respectively; P < 0.001), calcium (76% versus 33%, respectively; P < 0.001), phosphorus (63% versus 50%, respectively; P = 0.002), and PTH and Ca × P (59% versus 16%, respectively, P < 0.001), and allowed a 22% reduction in vitamin D dosage in patients receiving vitamin D at baseline. 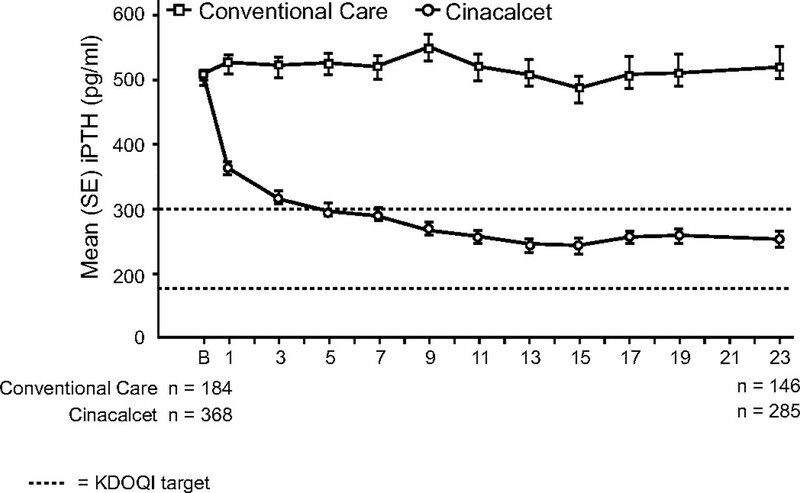 Achievement of targets was greatest in patients with less severe disease (intact PTH range, 300 to 500 pg/ml) and the cinacalcet dose required was lower in these patients (median = 30 mg/d). Conclusions: Compared with conventional therapy, a cinacalcet-based treatment algorithm increased achievement of KDOQI treatment targets in dialysis patients in whom conventional therapy was no longer effective in controlling this disease. Secondary hyperparathyroidism (SHPT), characterized by parathyroid hyperplasia and persistently elevated plasma levels of parathyroid hormone (PTH), commonly accompanies chronic kidney disease (CKD) (1–4). A major complication of SHPT is renal osteodystrophy, whereas alterations in calcium and phosphorus metabolism additionally contribute to soft tissue calcification (including cardiovascular calcification) (5–7). Elevated serum levels of PTH, phosphorus, and calcium × phosphorus ion product (Ca × P) are associated with an increased mortality risk (8–11). In recognition of this, the National Kidney Foundation Kidney Disease Outcome Quality Initiative (KDOQI) has published treatment goals for these patients (12). Conventional treatment for SHPT includes calcium supplementation, dietary phosphate restriction, oral phosphate-binding agents, active vitamin D sterols, and parathyroidectomy in patients refractory to therapy (13). Calcium supplement and calcium-containing phosphate binder use, however, induce hypercalcemia, particularly when administered concomitantly with vitamin D, which increases intestinal absorption of calcium and phosphorus. A significant proportion of hemodialysis patients receiving such treatment have elevated calcium and phosphorus, potentially requiring interruption of treatment that allows disease progression (8,13–15). Even in patients treated with paracalcitol that may have reduced capacity to enhance intestinal absorption of calcium and phosphorus, >60% experienced calcium levels >11 mg/dl and/or Ca × P >75 mg2/dl2 (16–18). Consequently, achievement of KDOQI treatment goals is difficult with conventional treatment and novel treatment strategies are required. The calcimimetics have provided an alternative approach to the treatment of SHPT by directly targeting the calcium-sensing receptor (CaR) on the parathyroid cell surface that regulates the secretion of PTH. These agents increase the extracelluar calcium sensitivity of the CaR to lower circulating PTH levels within 1 to 2 h of administration (19–22). Cinacalcet (Sensipar/Mimpara, Amgen Inc., Thousand Oaks, CA) has been shown to significantly reduce PTH levels in dialysis patients with poorly controlled SHPT when added to conventional treatment regimens while simultaneously bringing about a reduction in serum calcium, phosphorus, and Ca × P (23–26). Administration of vitamin D sterols in most previously reported studies of cinacalcet was kept relatively constant to isolate the effect of cinacalcet (24–26). In the OPTIMA (Open-Label, Randomized Study Using Cinacalcet to Improve Achievement of KDOQI Targets in Patients with End-Stage Renal Disease) study, we compared a new treatment algorithm using cinacalcet and optimized doses of vitamin D, with the use of conventional therapy, to achieve KDOQI treatment goals for serum PTH, Ca × P, calcium, and phosphorus in patients with uncontrolled SHPT. Patients were ≥18 yr of age with end-stage renal disease with SHPT and had required maintenance dialysis for ≥1 mo. Eligibility criteria included intact PTH (iPTH) ≥300 pg/ml and <800 pg/ml (bio-intact PTH (biPTH) ≥150 pg/ml and <410 pg/ml) and albumin-corrected serum calcium ≥8.4 mg/dl. Patients were excluded from the study if they had any unstable medical condition, were breastfeeding, had experienced a myocardial infarction within 3 mo of study day 1, had undergone a parathyroidectomy within 6 mo of study day 1, or had a gastrointestinal disorder associated with impaired absorption of oral medications or an inability to swallow tablets. Patients who received vitamin D therapy for <21 d or had a change in their prescribed vitamin D brand or dose within 21 d before study day 1 were also excluded. Finally, patients who were enrolled in other studies or had previously enrolled or participated in other cinacalcet clinical trials were excluded. The study adhered to the principles of the Declaration of Helsinki. The independent ethics committee for each study site approved the study protocol, and all patients provided written informed consent before the initiation of study-specific procedures. This open-label study consisted of three phases: a maximum 21-d screening phase, a 16-wk dose-optimization phase, and a 7-wk efficacy-assessment phase. Patients were stratified by baseline serum Ca × P (>55 or ≤55 mg2/dl2) and baseline vitamin D use and randomly assigned in a 2:1 ratio to receive either cinacalcet or conventional care (vitamin D and phosphate binders). For those randomized to receive conventional care, investigators were permitted flexibility to modify their treatment in an attempt to achieve KDOQI targets for PTH, Ca × P, serum calcium and phosphorus (12), with no specific criteria for increasing vitamin D dosing. Patients randomized to cinacalcet treatment were assessed at 2-wk intervals up to week 20 throughout the dose-optimization and efficacy-assessment phases, and treatment was adjusted according to the OPTIMA treatment algorithm (Figure 1). 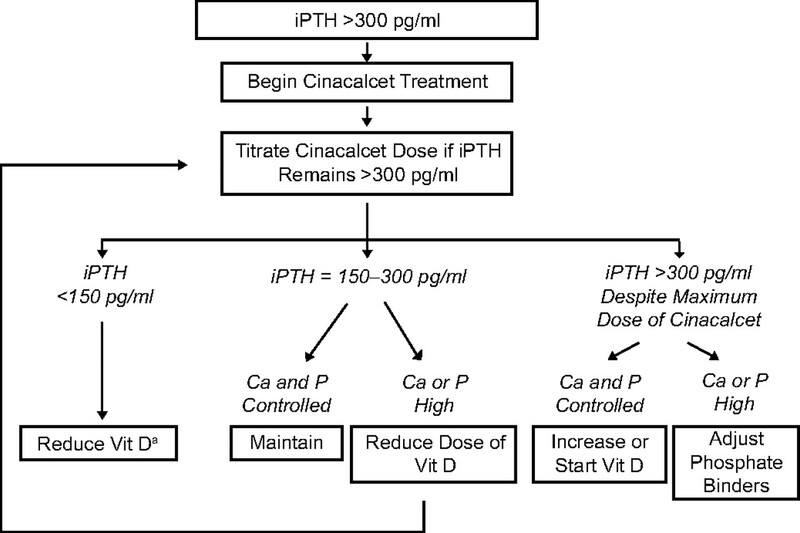 A patient's cinacalcet dose could be increased from a starting dose of 30 mg once daily to the next sequential daily dose in the series 30, 60, 90, 120, and 180 mg if their iPTH level was >300 pg/ml (biPTH >150 pg/ml) at the previous study visit, unless albuinin corrected serum calcium was <8.0 mg/dl or an adverse event precluded dose increase. The cinacalcet dose was to be reduced to the next lowest dose level if a patient's iPTH level was <150 pg/ml (biPTH <75 pg/ml) for two consecutive study visits and they were not receiving a vitamin D sterol, or this could not be further reduced. OPTIMA treatment algorithm. When indicated, the dose of a vitamin D (vit D) sterol was reduced by approximately 50% in sequential steps until a minimum administered dose was reached: intravenous calcitriol, 0.5 μg three times per week (TIW); intravenous alfacalcidol, 1 μg TIW; intravenous paracalcitol, 2 μg TIW; oral calcitriol, 0.25 μg TIW; oral alfacalcidol, 0.25 μg/d. aThe dose of cinacalcet was reduced if a patient was not receiving vitamin D.
After cinacalcet initiation, the dosage of any prescribed vitamin D sterol was optimized according to the treatment algorithm to achieve serum PTH, calcium, and phosphorus targets. When indicated (PTH <150 pg/ml and/or calcium and phosphorus exceeded KDOQI target levels), the dose of a vitamin D sterol was reduced by approximately 50%, in sequential steps, until a minimum dose (intravenous calcitriol, 0.5 μg three times per week (TIW); intravenous alfacalcidol, 1 μg TIW; intravenous paracalcitol, 2 μg TIW; oral calcitriol, 0.25 μg TIW; oral alfacalcidol, 0.25 μg/d) was reached. The vitamin D dose was increased if a patient's iPTH was >300 pg/ml despite reaching the maximum cinacalcet dose or in the event of hypocalcemia not resolved with oral calcium. Changes in phosphate binders were allowed according to the algorithm. Plasma PTH and serum calcium and phosphorus levels were measured at local laboratories at 2-wk intervals throughout the dose optimization and efficacy assessment phases (weeks 1 to 19). A final assessment was made at the final study visit of the efficacy assessment phase (week 23). All sites were instructed to use the same type of PTH assay throughout the course of the study. The primary end point was the proportion of patients with mean iPTH ≤300 pg/ml (31.8 pmol/L) during the efficacy assessment phase. Secondary end points included the proportions of patients with both mean Ca × P <55 mg2/dl2 (4.44 mmol2/L2) and iPTH ≤300 pg/ml; mean Ca × P <55 mg2/dl2; mean calcium <9.5 mg/dl (2.37 mmol/L); and mean phosphorus <5.5 mg/dl (1.78 mmol/L). Patient-reported outcomes were assessed at screening and at the end of each study phase (weeks 15 and 23), using the EQ-5D and KDQOL-SF quality of life questionnaires (27,28). The primary analyses of the efficacy end points were based on the full analysis set, comprising all randomized patients. The proportions of patients in the two treatment groups achieving the various end points were compared using the Cochran-Mantel-Haenszel test (stratified for baseline Ca × P and baseline vitamin D use). The means of the biochemical parameters (PTH, calcium, and phosphorus) during the 7-wk efficacy assessment period were used to evaluate efficacy. PTH levels measured with the bio-intact assay were multiplied by 1.95 for conversion to iPTH values (29). A last value carried forward method was used for patients who did not have laboratory values measured during the efficacy assessment period. The patient-reported outcomes were compared between the two treatment groups at each measurement point using the t test. The safety analysis included any randomized patient who had received at least one dose of cinacalcet or, if in the conventional care group, who had at least one postscreening visit. A total of 552 patients at 111 centers across Europe were enrolled, of whom 368 were randomized to receive cinacalcet and 184 to receive conventional care. Demographic characteristics and baseline laboratory values were adequately balanced between treatment groups (Table 1). Approximately two-thirds of patients in each group were receiving vitamin D sterols at enrollment, and almost all were receiving phosphate binders, with little difference between groups in the types of agents used. There were 340 patients (113 conventional care; 227 cinacalcet) with Ca × P ≤55 mg2/dl2 and 212 patients (71 conventional care; 141 cinacalcet) with Ca × P >55 mg2/dl2. As a result of site errors during the enrollment procedure, three patients (2%) in the conventional care group and 1 patient (<1%) in the cinacalcet group were within the recommended KDOQI iPTH target range at study entry. Five patients randomized to cinacalcet did not receive the drug and two patients randomized to conventional care received cinacalcet (as a result of administrative errors) for a few days immediately after randomization. Each of these patients was included in their assigned treatment group for the efficacy analyses. For the safety analyses, these patients were analyzed according to whether or not they had received cinacalcet. In total, 82% of patients in the conventional care group and 76% of those randomized to cinacalcet completed the efficacy assessment phase. Reasons for early discontinuation of study treatment included adverse events (1% conventional care, 7% cinacalcet), withdrawal of consent (2% conventional care; 4% cinacalcet), death (3% in each group), kidney transplant (3% conventional care; 2% cinacalcet), and other causes (7% conventional care; 5% cinacalcet). 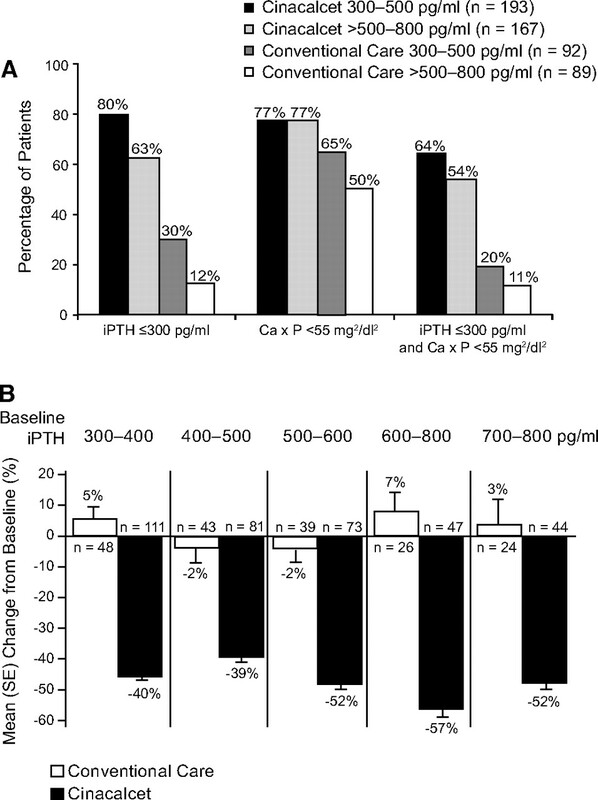 The percentages of patients achieving the targets and the mean changes from baseline in PTH, Ca × P, calcium, and phosphorus are summarized in Table 2 and Figure 2. Mean (SE) percentage change from baseline PTH, Ca × P, calcium, and phosphorus. During the efficacy assessment phase, 71% of cinacalcet-treated patients achieved an iPTH level ≤300 pg/ml (Table 2), 82% achieved an iPTH ≤300 pg/ml or a ≥30% reduction from baseline and 54% achieved an iPTH level in the range ≥150 to ≤300 pg/ml. The corresponding proportions of patients achieving these targets in the conventional care group were 22%, 28%, and 17%, respectively. Mean iPTH decreased by 46% in the cinacalcet group (from 505 pg/ml at baseline to 264 pg/ml during the efficacy assessment phase). In the conventional care group, iPTH increased from 507 pg/ml at baseline to 519 pg/ml during the efficacy assessment phase (Table 3; Figure 3). A total of nine assays were used across sites (data available for 85 sites); the majority of sites (78%) used one of three types of assay, the Immulite 2000-intact PTH (Diagnostics Product Corporation, Los Angeles, CA), Intact PTH Advantage (Nichols Institute, San Clemente, CA), or the Elecsys PTH (Roche Diagnostics, Indianapolis, IN) assay. The proportion of patients using the three assays was similar for both treatment groups (204/246 patients (83%) in the cinacalcet group and 135/177 (76%) in the conventional therapy group). Mean (SE) iPTH over time. Error bars represent ± 1 SE; iPTH: 1 pmol/L = 1 pg/ml × 0.105; B: baseline. A greater proportion of patients in the cinacalcet group achieved Ca × P <55 mg2/dl2, compared with conventional care (77% versus 58%, respectively; P < 0.001; Table 2). The mean Ca × P decreased by 12% in the cinacalcet group (from 53.6 mg2/dl2 to 45.7 mg2/dl2), but increased by 5% in the conventional care group (Table 3; Figure 4). Mean Ca × P over time. Ca × P: 1 mmol2/L2 = 1 mg2/dl2 × 0.08; B: baseline. A higher proportion of patients in the cinacalcet group achieved target values of both PTH and Ca × P simultaneously compared with in the conventional care group (59% versus 16%, respectively; P < 0.001; Table 2). During the efficacy assessment phase, 76% of cinacalcet-treated patients versus 33% of conventional care patients achieved Ca levels <9.5 mg/dl (P < 0.001; Table 2). Mean serum calcium decreased by 7% in the cinacalcet group but showed little change in patients receiving conventional care (Table 3). The proportion of patients achieving the targeted phosphorus level (<5.5 mg/dl) was also higher in the cinacalcet group than in the conventional care group (63% versus 50%; P = 0.002; Table 2). Among patients treated with cinacalcet, 80% of those with a baseline iPTH level of 300 to 500 pg/ml and 63% of those with a baseline iPTH >500 to 800 pg/ml achieved the iPTH target (Figure 5a). Patients with a mean baseline iPTH level of 700 to 800 pg/ml achieved a mean iPTH level above the KDOQI range (362 pg/ml), however, this still represented a mean decrease of 52% from baseline. (Figure 5b). Similarly, 64% of cinacalcet patients with a baseline iPTH level of 300 to 500 pg/ml group achieved both PTH and Ca × P targets simultaneously, compared with 54% of those with a baseline iPTH level of 500 to 800 pg/ml (Figure 5a). A, Patients (%) achieving end points by baseline iPTH levels. B, Reduction in PTH based on PTH levels at baseline. For cinacalcet-treated patients whose baseline Ca × P was >55 mg/dl, the mean (SD) changes in phosphorus and Ca × P were −14% (1.8) and −20% (1.9), respectively. In total, 90% of the cinacalcet-treated patients whose baseline Ca × P was <55 mg2/dl2 maintained control of Ca × P, compared with 74% of patients in the conventional care group. In the cinacalcet group 55% of patients with a baseline Ca × P ≥55 mg2/dl2 achieved control of Ca × P in the efficacy assessment period, compared with 31% in the conventional care group. The most common cinacalcet doses, used by 65% of patients, were 60 mg/d or less. A total of 6% of patients used the maximum 180-mg/d dose most often versus other dosages throughout the efficacy assessment phase. The mean and median doses were 56 mg/d and 30 mg/d, respectively. Lower doses of cinacalcet were needed to control PTH in patients with less severe disease (median daily dose of 30 mg in patients with baseline PTH 300 to 500 pg/ml and 60 mg in those with baseline PTH >500 to 800 pg/ml). The proportion of patients receiving vitamin D sterols increased from 66% to 81% at the end of the study in the conventional care group and from 68% to 73% in the cinacalcet group. Because of the different vitamin D analogs received by patients, direct comparisons of dosages administered in the two treatment groups are difficult. Nevertheless, by converting each dose received into a multiple of the protocol-defined minimum dose for a particular analog, it was possible to define a relative dose for comparative purposes (Table 4). Overall, there was a small change in the vitamin D relative dose in both treatment groups (14% increase in conventional care patients; 6% decrease in cinacalcet patients). However, as the OPTIMA algorithm specifically recommended increasing or decreasing the vitamin D dose depending upon the patient's condition, a larger difference occurred in those patients who were receiving vitamin D at baseline. 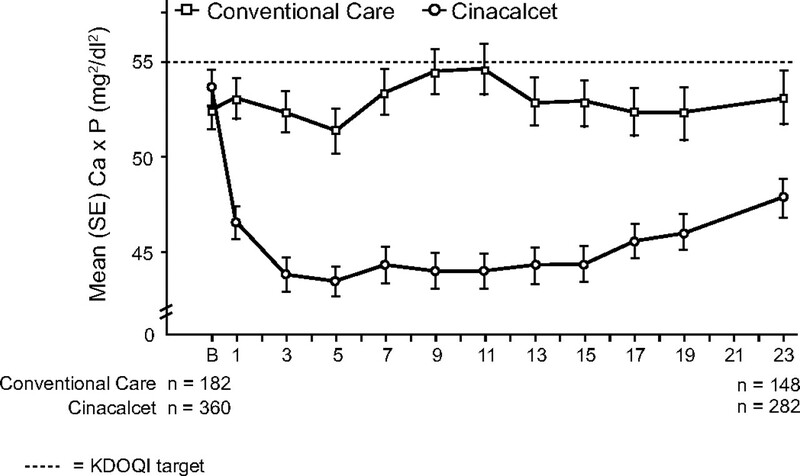 In this subpopulation the mean relative dose decreased by 22% in cinacalcet-treated patients, but increased by 3% in conventional care patients (Table 4). In patients who were receiving vitamin D and who had Ca × P >55 mg2/dl2 at baseline, the mean relative dose of vitamin D decreased by 51% in cinacalcet-treated patients, but increased by 8% in the conventional care group. The proportion of patients taking calcium-containing phosphate binders or calcium supplements remained essentially unchanged throughout the study in the conventional care group (approximately 42% of patients), but increased from 48% to 74% in cinacalcet patients. However, for those receiving calcium-containing binders or calcium supplements, the mean daily oral dose of elemental calcium remained relatively constant throughout the study in both treatment groups (2.2 g/d in cinacalcet patients and 2.1 g/d in conventional care patients at week 23). The proportion of patients receiving sevelamer-based binders during the study decreased from 52% to 48% in the cinacalcet group but increased from 54% to 60% in the conventional care group. Similarly, use of aluminum-based binders decreased from 19% to 12% in cinacalcet patients but increased marginally for conventional care patients (20% to 21%). In those patients treated with sevelamer at week 23, the mean dose was 5 g/d in the conventional care group compared with 4.5 g/d in the cinacalcet group. Although the overall mean doses of vitamin D and phosphate binders remained relatively stable, there were substantial changes in the use of these drugs in individual patients receiving conventional care; ie 51% of patients either started vitamin D or had their dose increased, whereas 43% decreased or stopped vitamin D at some point during the study. In addition, almost half of patients who received calcium-containing phosphate binders or sevelamer in the conventional care group had a change in their dosage. The mean (SD) dialysate calcium concentration remained relatively stable in both treatment groups (cinacalcet group: 2.7 (0.5) mEq/L at baseline, 2.9 (0.5) mEq/L at week 23; conventional care group: 2.7 (0.5) mEq/L at baseline, 2.6 (0.5) mEq/L at week 23). The mean (SD) EQ-5D utility index score and KDQOL-SF scale scores at baseline were similar in both treatment groups and remained essentially unchanged in each group throughout the study. A total of 80% of cinacalcet patients and 59% of conventional care patients experienced at least one adverse event (Table 5). The most common adverse events were mild to moderate nausea and vomiting, both of which were reported more frequently in the cinacalcet group than in the conventional care group (nausea 32% versus 3%; vomiting 24% versus 7%). In total, 3% of patients discontinued cinacalcet use because of nausea and 2% because of vomiting. Diarrhea was also more common in the cinacalcet group (13% versus 7%). Three percent of patients in the two treatment groups died during or within 30 d of discontinuation of causes consistent with those commonly seen in this patient population. The most common causes of death were myocardial infarction (one conventional care patient, two cinacalcet patients) and sudden cardiac death (one patient in each treatment group). Other causes of death were single events. Hypocalcemia (serum calcium <7.5 mg/dl on at least two consecutive measurements during the study) occurred in 5% of patients receiving cinacalcet and 1% of patients receiving conventional care. The KDOQI guidelines for the management of bone metabolism and disease in CKD are evidence-based treatment recommendations that aim to reduce the risk of vascular calcification and bone disease through the control of biochemical parameters. 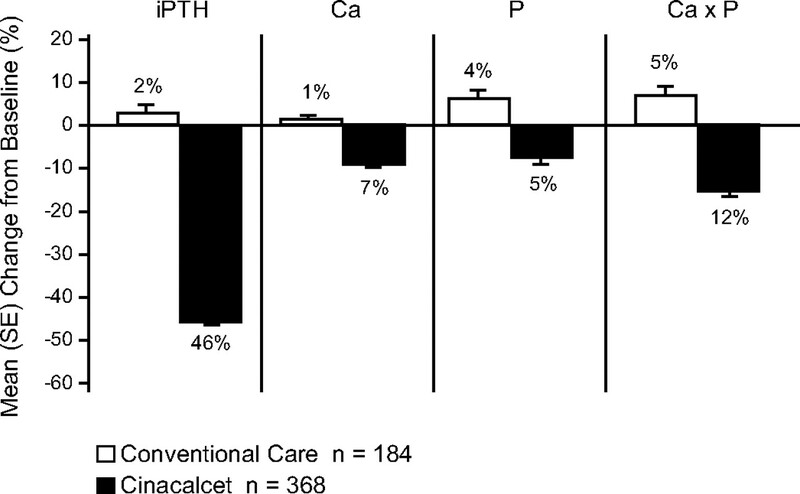 Cinacalcet is unique in its ability to simultaneously lower PTH, calcium, phosphorus, and Ca × P in patients with SHPT and thus could become an important component in treatment regimens for this disease. The OPTIMA treatment algorithm was designed to be a practical treatment paradigm that builds upon the properties of cinacalcet by increasing or decreasing vitamin D dosage to increase the achievement of treatment targets. Achieving control of PTH, calcium, and phosphorus levels with conventional treatment in CKD patients with SHPT presents a considerable challenge. This was well illustrated by the Dialysis Outcomes and Practice Patterns Study (DOPPS II). Of approximately 4000 patients on hemodialysis, only 26.2% had mean iPTH values within the KDOQI target range of 150 to 300 pg/ml (30). In our study, despite the best efforts of investigators and more stringent monitoring of patients (as required by the study protocol) compared with clinical practice, only 22% of patients receiving conventional care achieved the iPTH target, with no change in the proportion of patients reaching the Ca × P target range. This might at least in part reflect the fact that the patients enrolled in the study had reached the limits of conventional treatment, with limited additional options for the control of SHPT in those in the conventional treatment group. Indeed, in the 27% of patients in the conventional group who did not receive vitamin D at the start of the study, but did so after the study began, the mean relative dose was low (1.28), which suggests it was not possible to aggressively use vitamin D in this group of patients. Furthermore, the deliberate lack of uniformity in the treatment that the conventional care patients received possibly enhanced the superiority of cinacalcet treatment. Application of the cinacalcet-based OPTIMA treatment algorithm resulted in significant reductions in mean iPTH values, with 71% of patients achieving the primary end point of a mean iPTH value ≤300 pg/ml and 82% achieving either mean iPTH ≤300 pg/ml or a ≥30% mean reduction from baseline. Thus, the addition of cinacalcet to vitamin D therapy results in additional control of iPTH in patients with SHPT who previously failed treatment with vitamin D alone. The decrease in iPTH values affected by cinacalcet was accompanied by reductions in mean Ca × P, calcium, and phosphorus levels consistent with previous studies (23–26). These parameters remained essentially unchanged among patients receiving only conventional care. In reporting these highly encouraging data, we should acknowledge a paper by Souberbielle et al. (31), which has shown marked variation in iPTH measurement readings using different assays. In this study, most sites used one of three different types of assay, and this was balanced across treatment arms; therefore, the reported degree of change for PTH from baseline to the end of the study may be presumed to be reliable. Another potential influence on our findings might result from site effects whereby imbalances in the distribution of patients by treatment group between centers affects study results. However, our analyses showed that the majority of sites (89/111 or 80%) recruited six or fewer patients, and only 2/111 sites recruited >15 patients. Although the randomization was not stratified by site, 98 of the 111 sites (88%) or 83% of patients had treatment allocations that were consistent with a randomization stratified by site. It was not feasible to perform an analysis adjusting for site because interpretation would have been difficult with so many small centers. In the majority of previous studies that evaluated cinacalcet in patients with SHPT, alteration of vitamin D dosage was permitted only on the grounds of patient safety (24–26). In one 2-yr cinacalcet study, investigators were permitted to adjust the dose or type of vitamin D sterol used to mimic normal clinical practice (32). The results from this long-term study by Moe et al. showed no significant change in either the proportion of patients receiving vitamin D sterols or phosphate-binding agents, or in the doses of either. In our study, with doses of cinacalcet, vitamin D sterols, and phosphate-binding agents optimized according to the OPTIMA algorithm, the mean relative dose of vitamin D sterols decreased by 22% in patients who were using vitamin D treatment to control their PTH. In the subset of patients with Ca × P >55 mg2/dl2 where the utility of vitamin D had reached its limit, the OPTIMA algorithm enabled a 51% reduction of vitamin D usage with comparable or greater reduction of PTH and Ca × P, compared with the overall cinacalcet study population (Figure 2). The combination of cinacalcet plus decreased vitamin D enabled a 14% reduction in phosphorus levels and a 20% reduction in Ca × P levels in these patients, suggesting the efficacy of this therapeutic strategy. In accordance with the current clinical practices of reserving novel therapies for patients with more severe disease, cinacalcet is currently most often used in SHPT patients with severely uncontrolled PTH or in those with Ca × P >55 mg2/dl2. Although patients with a high PTH level might be expected to be less likely to achieve treatment targets, the significant and simultaneous reductions in PTH and Ca × P levels observed in this study indicate the potential for major clinical benefits in terms of improved disease control in these patients. We did find that patients with less severe disease (iPTH between 300 to 500 pg/ml) were more likely to achieve study targets than those with higher baseline iPTH levels, and the dose of cinacalcet required to achieve the recommended targets was lower in patients with less severe disease. This suggests that treatment of SHPT with cinacalcet in earlier, less severe disease stages may be more cost effective, although appropriate analyses are needed to confirm this supposition. The long-term benefits, if any, of commencing cinacalcet treatment early in the course of SHPT remain to be determined, but earlier and sustained achievements of KDOQI targets might result in improved clinical outcomes for patients. There were no unexpected safety findings from tolerability data in the cinacalcet group compared with previous studies (24–26,32). This study's open-label design may have led to an unplanned bias that contributed to an underreporting of nausea and vomiting in the conventional care group, resulting in the lower than expected incidences of these events observed in these patients. In summary, this study was the first trial to directly compare the efficacy of cinacalcet with unrestricted conventional care. Whereas it is possible that the efficacy of cinacalcet relative to conventional treatment may have been enhanced by the inclusion of patients who had reached the limits of conventional therapy, our data show superior efficacy for the cinacalcet-based treatment algorithm in achieving the stringent key metabolic targets for patients with SHPT. Furthermore, cinacalcet allowed the attainment of these targets with a lower dose of vitamin D sterols. Willem Jan Bos has participated in advisory boards for Amgen and Abbott. Johann Braun has received honoraria from Amgen and Genzyme and participated in advisory boards for Amgen. Dave Carter is employed as a contractor for Amgen. João M Frazão has been a scientific consultant for Amgen and Genzyme. He has also participated in advisory boards for Amgen, Genzyme and Abbott. Helmut Graf has received honoraria from Amgen and Fresenius. Francesco Locatelli has participated in advisory boards for Amgen, Dompé Biotech, Shire, Mitsubishi and Abbott. Piergiorgio Messa has given lectures supported by Amgen, Janssen-Cilag, Abbott, Novartis and Roche. He has also participated in advisory boards for Abbott and Novartis. Bart Molemans is an employee of Amgen. Helmut Reichel has participated in advisory boards for Amgen. Heikki Saha has given lectures supported by Abbott, Amgen, Astellas and Genzyme. Beat von Albertini has participated in advisory boards for Amgen Switzerland. Martin Wilkie has given lectures supported by Amgen, Baxter and Fresenius. He has received honoraria from Amgen, Baxter, Fresenius and Shire. He has also participated in advisory boards for Amgen, Baxter and Shire. Valter Zani is an employee of Amgen. The other authors have no conflicts of interests. The authors express their gratitude and thanks to the patients and their healthcare providers for participation in this clinical trial. The authors also thank Peter Royce, Julia Balfour, Elizabeth Pham, and Antonia Panayi of Amgen Inc., for their editorial assistance in the development of the manuscript. Data from this study have previously been presented at the American Society of Nephrology 2005 (November 8 through 13, 2005, Philadelphia, Pennsylvania) and the National Kidney Foundation 2006 (April 19 through 23, 2006, Chicago, Illinois) Meetings. We would also like to thank the OPTIMA investigators, including A. Albertazzi, P. Altieri, P. Altmann, S. Al-Sarraf, M. Andre, U. Bahner, C. Baldamus, A. Balducci, M. Becker, A. Bock, W. Boesken, D. Bokemeyer, J. Bommer, J. Bonal, K. Bouman, J. Bradley, C. Cascone, G. Colussi, J.M. Cruz, J. Cruz, J. De Meester, N. De Santo, M. Dhaene, B. Draganov, K.U. Eckardt, A. Fernstrom, A. Ferreira, R. Fiedler, J. Floege, P. Fröhling, G. Fuiano, M. Galicia, L. Gesualdo, M. Girndt, R. Gokal, K. Gondolf, T. González, H. Graf, S. Grosser, E.C. Hagen, M. Heydenreich, H. Holzer, E. Honkanen, E. Hübel, A. Hutchison, N. Ibrahim, E. Imbasciati, R. Jofre, M.G. Koopman, J. Kovarik, R. Kramar, K.M.L. Leunissen, J.D. Lippert, G. Liuzzo, G. Lonnemann, V. Lorenzo, G. Martín, P.Y. Martin, A. Martín-Malo, G.J. Mayer, A. McLean, G. Mellotte, T. Meyer, A. Morawietz, G.A. Müller, J. Navarro, P. Neves, J. Olivares, J. Paβfall, P. Pai, A. Palma, P. Peeters, P. Ponce, A. Procaccini, H.P. Rau, B. Riedl, S. Roe, L.C. Rump, J.A. Sánchez Tomero, M. Salvadori, A. Santoro, H.J. Schmidt-Gürtler, E. Scheuermann, A. Schleser, H. Schneider, H. Seidel, G. Splendiani, A. Stahl-Nilsson, A. Stalteri, B. Stegmayer, H.K. Stummvoll, E. Svarstad, M. Traub, D. Uehlinger, R. Valentin, G. Villa, A. Voβkühler, R.P. Wüthrich. This study was sponsored by Amgen Inc.